Asemic 15 is the new edition of Asemic magazine, following Asemic 5 which was published several years ago. 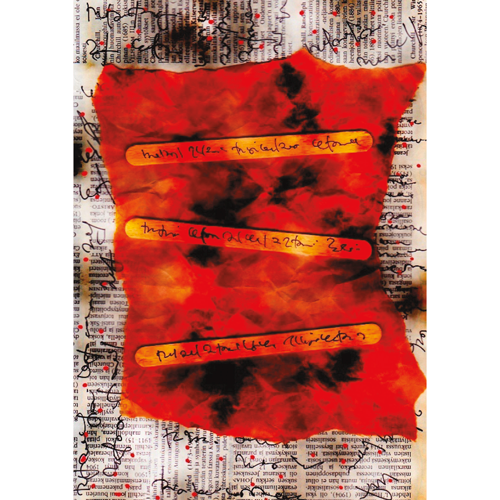 The magazine presents many forms of illegible asemic writing from around the world, as well as abstract art which is trying to morph into writing. Contributors: Elynn Alexander, Roberto Altmann, anonymous, Rosaire Appel, Roy Arenella, Roland Barthes, Billy Bob Beamer, Tori Bedford, Volodymyr Bilyk (Володимир Білик), Jeff Crouch, Marc van Elburg, karen eliot, Jesse Ferguson, Tim Gaze, Marco Giovenale, Rob Grant, Janet Hawtin, Christine Huber, Ronald D. Isom, Satu Kaikkonen, Evgenij V. Kharitonov (Евгений В. Харитоновъ), Eduard Kulemin (Эдуард Кулёмин), Sveta Litvak (Света Литвак), Constança Lucas, Serse Luigetti, Billy Mavreas, Willi Melnikov (Вилли Мельников), Andrei Molotiu, Sheila E. Murphy, Moulid Nidouissadan, Fernando Ocampo, Marilyn R. Rosenberg, Ruan, Shmuel, Christopher Skinner, Tommasina Bianca Squadrito, Carol Stetser, Morgan Taubert, Miron Tee, Mike Di Tommaso, Troylloyd & Emma Viguier.